Removals Company Bournemouth, Woods Removals Ltd.
Click for a quote | call Mon - Sat. 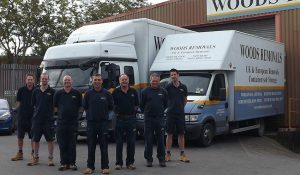 Woods Removals makes moving in Bournemouth a streamlined and straightforward process. Since we’ve been going for 140 years, there’s nothing we haven’t encountered and no problem for which we haven’t a solution. Not every removals company in Bournemouth comes to you with our degree of experience or expertise. We’re better than competent – we listen and take note of exactly what your move requires so that we can adapt our services all the better for moving you. A century and a half of knowledge and skill is at your disposal from start to finish. We know Bournemouth incredibly well, so we don’t lose precious time on the road – instead, we chart a fast course from A to B and get there punctually. All our drivers, movers and packers are BAR-certified which brings you certain standards and protections. What’s more, they all know what they’re doing. There’s nothing worse than realising your move is in the hands of incompetents or charlatans – with us, you’ve got people who care about doing the job well. We’ll bring calm, forethought and strategy to your house-move so that you’re free of stress and able to keep on living your life to the full. Why not avail yourself of our full packing/unpacking service too? It’s a huge relief to know that our packers are on standby for you. They are fully trained and know exactly what packaging materials to bring to the job. Whether it’s artworks, grand pianos or irreplaceable antiques, they’ll come equipped with the appropriate knowledge for handling and, where necessary, dismantling, and they’ll secure everything so that it’s utterly safe in transit. It’s a level of care and understanding you just cannot always expect form other removal companies in Bournemouth. Your moving process begins when one our estimators comes to visit you. All the necessary details will be discussed and then a clear and straightforward quotation is issued to you. When you’re ready, we’ll get to work, planning your move in advance so that it goes ahead without troubling your peace of mind. If at any point you need storage in Bournemouth, then you’ll find our facilities safe, secure and easy to use.